"THERE WERE THOSE WHO BELIEVED..."
That life here began out there, far across the universe, with tribes of humans... who even now fight to survive somewhere amongst the stars... And there are those who still believe! This mod is an attempt by amateur modders (me, Hyrum, and another guy who loves BSG even more than I do)) to bring the original Battlestar Galactica universe to the FoC game. We are planning and are currently in development of a large scale space battle and ground battle system that I hope will have totally unique gameplay. We are also hoping to have an interactive galactic conquest map with over 50 new planets. The conquest would take place over five eras: Hassari Conflict, Great Cylon Conflict, Thousand Yahren War, the Exodus, and Cylon Civil War. Advancement through eras would take place upon the capture of certain planets and the completion of certain objectives. Our unit list is rather limited right now, but we hope to include units inspired by the attempted continuations of the series by Richard Hatch, and Brian Singer-Tom Desanto. Our goals may seem ambitious, but given time we will accomplish them- AND bring complete order to the Universe while we're at it. Help from veteran FoC modders definitely needed and would be greatly appreciated! Hey guys, been awhile since my last update. The mod is not dead. I've recently gotten a few more resources as well as someone to help me with the mod, including for me to have the ability to add my own models to the mod using blender thanks to an addon I got from the author of the Phoenix Rising mod. I'll get a schedule up for myself once I get a bit more familiar with the software but things should be up and running at a regular pace now. No promise yet when the first alpha test will be (I have no idea when this will be atm), but once I get things scheduled I'll be able to make more updates! I too am just getting into tinkering with XML. Your definitely ahead of me lol. Nice idea of making the "Thousand Yahren War". TOS of Galactica was my favorite (Simply because of its simplicity and the fact that the same people who did the ILM Model making for Star Wars did Galactica, It has that Original Trilogy Flavor and sense of Urgency). ESB even had a few of the Rag-Tag Ships from the 1978 series for the end scene as background ships in the Rebel Fleet. I'd love to contribute if that is at all possible. If you want to be on the team, just send me a pm listing your experience and stuff you can work with. The mod is in a bit of a limbo because I'm waiting for models and school gets in the way a bit. However I do have some progress to write an update for. Well, I'm back in school. I haven't much time for modding for a few months. Yup, I've been busy just basically learning how to mod and have had my time split between two projects. I did a mod for another game that had a slightly higher priority for me than this one. 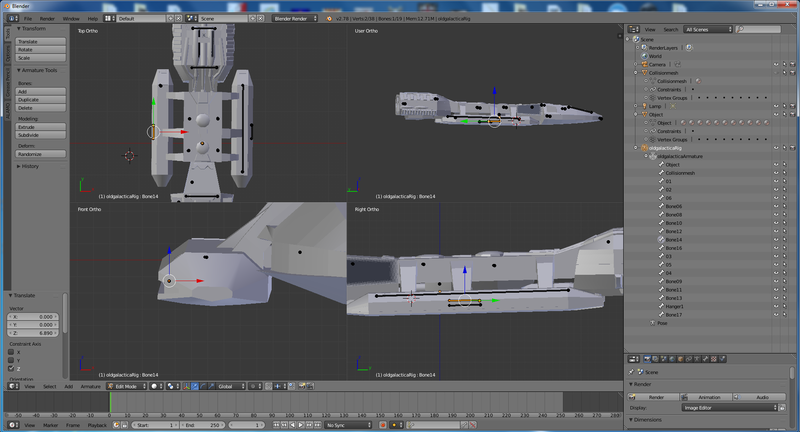 I haven't completely ignored BSG though, but my biggest roadblock is a need for models in the proper format. Don't expect articles too often though, as they take a lot of time to produce. I will stay active in the comments. I do plan on including a galactic conquest based around fleeing from the Cylons as a key component of the mod. Both the original series and the new reimagined series have this Exodus from the cylons in common.